Lil' Lion Halloween Costume for dogs is wildly comfy and features super soft fabric from head to tail. Three tones of brown, medium pile plush create a luxurious lion's coat, and the belly, leg, and trim are made of soft ivory velour. A face-framing hood features a long, fluffy mane and stand-up ears for an authentic lion look. 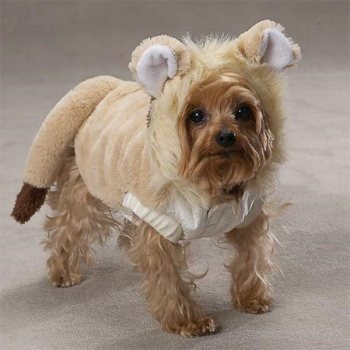 The Casual Canine® Lil' Lion Costume fastens with Velcro® from neck to belly. Designed for comfort and convenience with a leash hole, lower belly cut-out, and a non-stick poly-lined interior. Get ready for a roaring good Halloween!